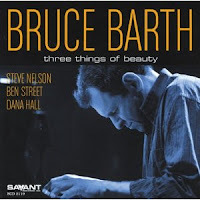 Bruce Barth is one of the most respected pianist on the scene and rightfully so. A talent with a discography that stretches now to 12 albums and countless guest appearances, Barth has been consistent and always refreshing. On his latest, Three Things Of Beauty, Barth delivers a sophisticated yet bubbly document of harmonies that is sure to have fans and newcomers enthralled. Always a delicate and nimble player, Barth orchestrates some superb lines on the opener "My Man's Gone Now." The tune jumps and burst with enthusiasm. The stellar line-up of Nelson, Street and Hall gives Barth a chance to hang back in addition, allow his mates to shine, as Nelson and Street do with some lovely exchanges. "Wise Charlie Blues" shows the continued influence Thelonious Monk has had on Barth. A complicated playfulness I always like to call it. A dedication to a dear friend of Barth's, he mixes blues, gospel and improvisation into a health dose melodica. His bandmates add blue-ish hue to the tune while Barth places the emphasis squarely on empathetic notes. "Three Things Of Beauty," a ballad with more emotion and dreamlike qualities than I originally thought when I first listened to the tune, is sublime. Nelson's vibes echo across the melody. While Barth's presence is key here, he also allows Street and Hall to rise a little in this setting. It's much more a group piece than a usual album title track which would focus squarely on the leader. "Wondering Why" is soulful, midtempo piece that is casual and yet still bouncy enough for you to get lost in the rhythm. The album closes with a duet between Nelson and Barth, "The Song Is You." A sweet tone and upbeat theme, the two joyously carry the listener out on a positive and festive note. Bruce Barth has once again shown what a agile and perfect leader, composer and performer he is in almost any setting. The group he has circled himself with, while having played with them in various sessions in the past--this time they have really made sparks from beginning to end. If you haven't heard Bruce Barth before, now is the time to start taking notice. 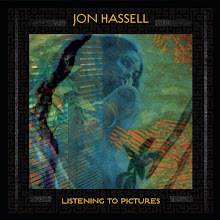 Three Things Of Beauty is one the best albums of an already glistening career.